Pam Baginsky (l), 2014 Citizen of the Year, receiving her award from Tammy Roppel (r) of the Auburn Civitan Club. 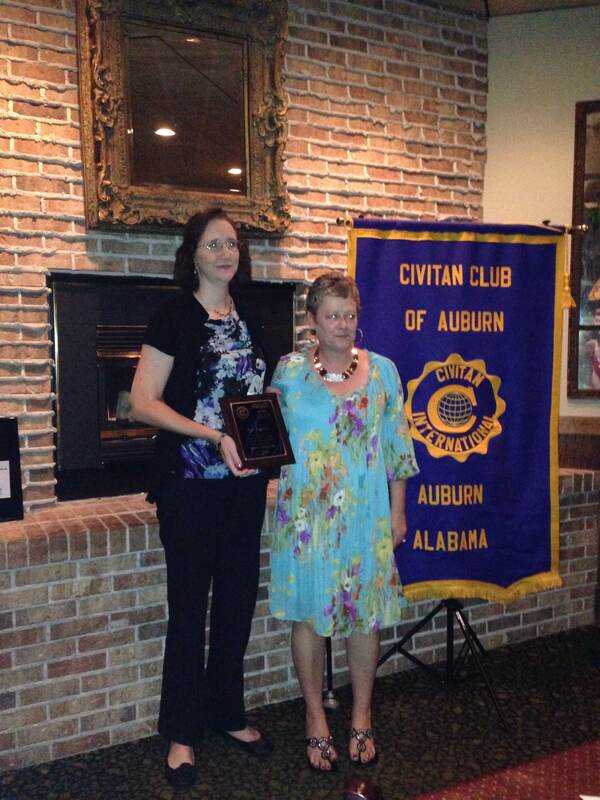 Pam Baginski received the Auburn Civitan Club’s 2014 Citizen of the Year award at the annual Awards and Installation Banquet held at Venditori’s Restaurant on Friday, September 19, 2014. Pam has supervised the food pantry as a volunteer at Lakeview Baptist Church since 1999. She and her staff provide an average of 30 families each week with grocery staples. Pam spends 20-30 hours each week visiting local grocery stores, the East Alabama Food Bank, and other places to get as much food at the lowest cost possible. Then she organizes the food pantry, sorts the food, and trains the people who help each week. Besides providing food, Pam invests in a relationship with the families who come for food. She shares her faith with them, and learns about their needs. She is often able to help them find community resources for things other than food, such as coun-seling, housing, jobs, car repair, etc. She is always looking for ways to pro-vide more than just the basics and to brighten people’s lives. Each week she is usually able to provide dessert items like cakes, cookies, coffee, and fruits in season. Pam leads by example. She provides encouragement for her staff with kind words, a ready smile, and plenty of good humor. She is a great listener, and she makes everyone around her feel comfortable and very welcomed. This entry was posted in Uncategorized on September 20, 2014 by kviversen.